Top 7 Family Holiday Destinations in Queensland - Go For Fun: Travel, Sailing, Photography - Inspiration, Tips, Adventures - Australia and The World! Queensland is known as “the sunshine state” and it’s easy to see why. These popular destinations provide days of endless sunshine and picturesque views of the glistening Pacific Ocean. Discover the Great Barrier Reef or go whale watching at Harvey Bay – wherever you take your family, your kids will love the attractions of a Queensland holiday. Manmade lagoons on the coast of Cairns provide the perfect location for a family BBQ or a day cooling off with the kids. 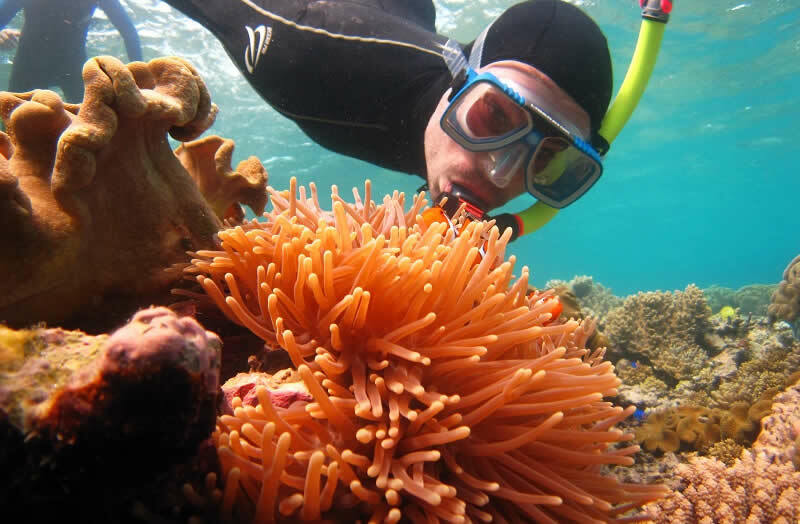 Cairns is also the gateway to the Great Barrier Reef, so why not organise a day of snorkelling or diving amongst the spectacular marine wildlife. While most destinations have you making the choice between something that the kids will enjoy and something that mum and dad will like, Brisbane offers a huge variety of activities for the whole family. South Bank is one of the best places to spend a family day out in Brisbane and is located along the banks of the Brisbane River. Every weekend and most Friday nights the streets of South Bank come alive with a lifestyle market, offering products that range from arts and crafts to clothing from new designers. Take a 20 metre walk from the central markets and you’ll discover a man-made beach in the heart of Brisbane City. Kids can spend all day playing in the sand and frolicking amongst the playground water features. Located just 45 minutes north of Brisbane City is Bribie Island. If you’re a 4WD enthusiast you’ll spend hours discovering the pristine white beaches of the island, while the kids will love a camping adventure with mum and dad. Located in the Fraser Coast Region, Harvey Bay attracts thousands of national and international tourists, hoping to get a glimpse of the friendly giants of the ocean. Humpback whale watching is the most popular attraction for Harvey Bay, with the season running between June and November. The whales that frequent the Fraser Coast region each year like to show off and really play up to the cameras, so get ready for some fantastic holiday happy snaps! If you’re looking for speeding roller coasters and death defying stunt shows, there’s no beating a family holiday on the Gold Coast. Surfers Paradise is the most popular beach on the coast, attracting thousands of tourists to endless sunshine and an unbeatable nightlife. Just a short drive for Surfers Paradise, you will find the best theme parks in the Gold Coast, if not Australia. Home to Warner Brothers Movie World, Dream World, Wet n Wild Water World and SeaWorld, your kids will love you for taking them on this family holiday! While the city of Townsville may not pose the best shopping districts or hottest nightlife in Queensland, it does offer a great variety of family friendly activities. “The Strand” is located on the coast of Townsville and is a free, outdoor playground and water activity centre, which the whole family will enjoy. Go on the swings or plunge down a slide as you get drenched in buckets of water from above! This is the perfect way to spend a hot and humid afternoon in Townsville. Easily accessible from Harvey Bay, Fraser Island is the largest sand island in the world and is most commonly reached via ferry from the mainland. Crystal clear lagoons and coloured sands cover the island, while lush tropical rainforests provide the perfect shade for setting up camp.